You look forward to it like a birthday party when you're a kid. You think something wonderful is going to happen. What�s that you say Mrs Robinson? �Joltin� Joe has left and gone away." 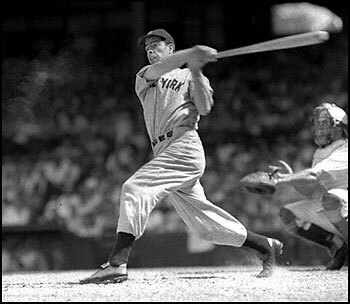 "I would like to take the great DiMaggio fishing,' the old man said. 'They say his father was a fisherman. Maybe he was as poor as we are and would understand." Did you know that if I got a hit tonight I would have made $10,000? The Heinz 57 people wanted to make some deal. Because there is always some kid who may be seeing me for the first or last time. I owe him my best. I want to thank all my teammates who scored so many runs; Joe Dimaggio, who ran down so many of my mistakes, and Johnny Murphy, without whose relief pitching I wouldn't be here. "I can describe Joe in one word: class. 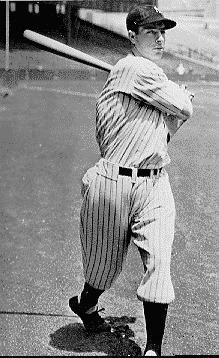 He was the most perfect ballplayer I ever saw, but, he was a shy fellow. I'll tell you something else though. 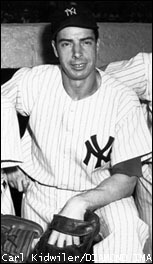 When Joe DiMaggio walks into the clubhouse, the lights flicker. He's the star." 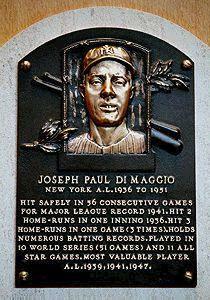 Have any DiMaggio Links to share?